Here's my take on the OWH sketch challenge #237. I used a fun House Mouse image, and colored those big shoes with fluorescent Copics. I also colored the blue and peach panels with the same Copics to color coordinate everything. I embossed the background with a SB M-bossabilites kickin' rubber ef, and used a Hero Arts sentiment on the bottom. The circle sentiment was made with a set of $1 stick stamps and matted with chocolate chip cardstock. I added a piece of ribbon from my stash, and stamped a pair of big shoe footprints on the inside in keeping with the "big shoes to fill" theme. Have a great Wednesday and thanks for stopping by! No, but I have cherry! LOL! How cute! That embossing folder looks awesome. So cute, Carol. I love those rockin' big shoes. He sure looks in a hurry....I would be, too, if there was apple pie in my future. :-) What a wonderful ef to go with your image. If you're going to be cooking an apple pie, I'll be just like this little guy and be on my way soon! Precious card and I love the bright and fun shoes on him. Amazing embossing folder, love that little guy with those big shoes! Those boots were made for walking! what a fun card. I have just made a blackberry crumble from blackberries picked from the hedgerows locally. Thenik there is a bumper crop of them this year. Hugs Mrs A. Fun card, Carol, very amusing!! What a super card, I love the cute image and the colourful background you made. That EF is perfect to go with the stamp. I am on my way!! Can I have custard please? Can my fwend come too please? He likes apple pie too. Your card is gorgeous. I just love that mouse with huge shoes on! Fun card! I have that EF and rarely use it although it is one of my faves! tfs!!! If you have apple pie I'll be there in a jiffy too! Great card. I love that EF with the footprints. Too nifty! I like all the shoe imagery. It's cute and different. LOL, Apple Pie? my favourite! I'd come home for any flavor pie. I have seen a lot of pie cards today - I am going to have to make one or something. 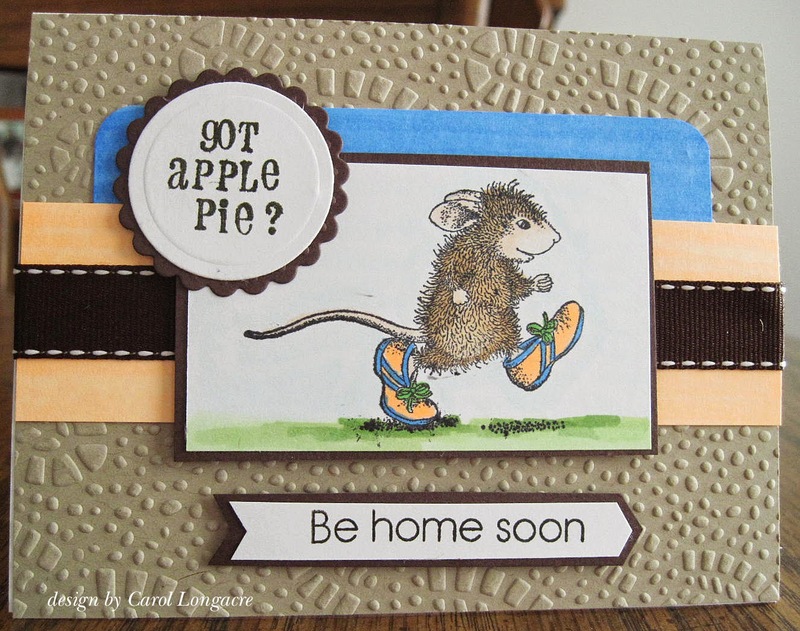 Cute card - love the image and your sentiment is yummy and fun. Hugz!